Tea and Savories: How Many Gadgets are Too Many? How Many Gadgets are Too Many? I keep thinking I would like to ease up a bit on possessions but last week I ordered a rice cooker with a stainleess steel bowl. This is to replace our current rice cooker. It still works fine and is only a year old but already the non-stick coating has numerous scratches. Yesterday I decided on a simple meal of bread, cheese, and apple because I didn't want to make a big production of lunch. It took three knives to prepare. One chefs's knife to slice the apple, one serrated with holes for the cheese and a large serrated one for the bread. Each of these knives is uniquely engineered to make its task easier. The chef's knife could be used for all three, but it is hard to slice through a thick loaf of cheddar and it tears up the bread. The cheese knife glides through cheese and has a serrated edge so might work on bread. Neither of the serrated knives is good for fruit. It's too easy for it to slip on a round object as I found out when I used on on an orange. Many bandages were needed. This photo is not clear because I re-sized it with Photoshop CS5 (yes, another recent purchase). It does not work like Photoshop Elements 5 which I can only use on the old PC and not the Mac (and that is not the total number of computers in the house). The rice cooker makes cooking rice easier. Fill it up, turn it on and it does the work. I can't even make rice on the stove and I am so happy to have found one without that nasty coating. 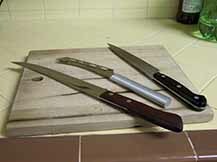 Each of the knives makes its task easier and safer. I expect the new rice cooker will work much like the old one. Knife instructions haven't changed for centuries. This is not true of computers and software. I don't have the time to figure out why this re-sized photo isn't right; the laps lanes are opening at the pool in two minutes.